Saint Louis University Athletic Training Program: Welcome to New Instructor Whitney Linsenmeyer! The Saint Louis University Athletic Training Program is proud to announce that Whitney Linsenemeyer MS, RD, LD is the new Course Coordinator for MAT 5160 - Bioenergetics of Athletic Performance! Whitney Linsenmeyer is a registered and licensed dietitian in the Department of Nutrition and Dietetics at Saint Louis University. 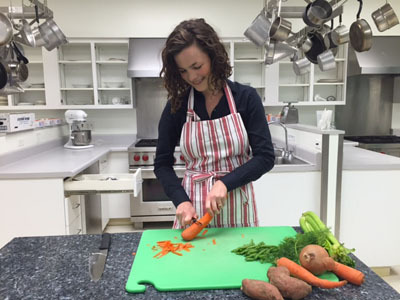 She started a school lunch program that serves nearby St. Louis schools before joining SLU Nutrition & Dietetics as faculty, and now teaches courses including Foundations of Nutrition, Nutrition in the Lifecycle, Clinical Systems Management, and Culinary Medicinal Herbs. She has a monthly segment on KMOV Great Day St. Louis where she highlights everything from the health benefits of beer to how to pack a power lunch. Whitney loves the quote by Michael Pollan, "Eat food. Not too much. Mostly plants."